A week-long education campaign is underway. 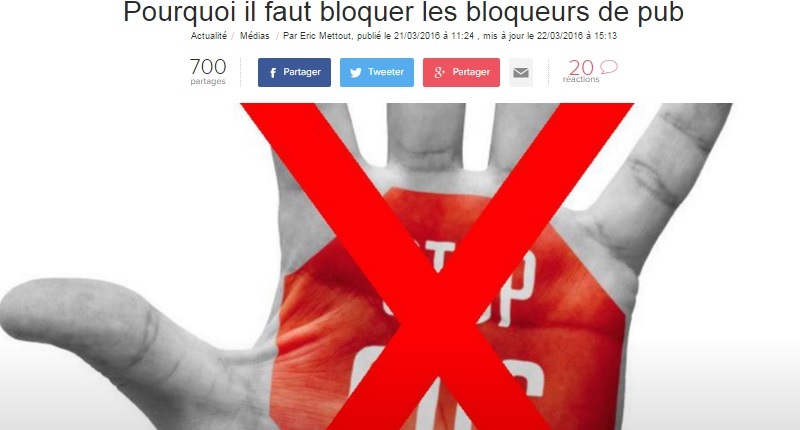 There’s also (if you read French) an emphatic first-person companion blog post by the same author, L’Express editor in chief Eric Mettout, titled “The Ad Blockers Killed Me.” It’s all in support of a week-long effort by a coalition of French newspapers and other media outlets to educate the public about the threat to their business model presented by ad-blocking software and to plead with readers to uninstall these tools. The outreach campaign was organized by the French newspaper industry association GESTE. Ad-blocking software remains a hot topic across the world; last month, during a New York Social Media Week conversation, New York Times CEO Mark Thompson suggested the paper might start blocking ad-blocking software users.